So recently my players and I cracked open a copy of Mai-Star courtesy of a friend of mine. I’d heard of the game but I did not have the chance to back it. I did not know what to expect but let me just say that I am pleasantly surprised with the game, it is amazing. You start off with the below components, it’s a simple game to say the least. 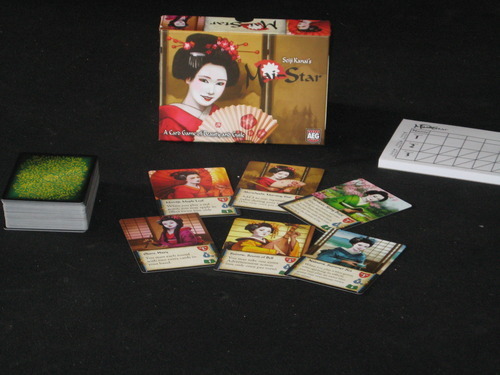 Geishas – Each have their own ability, usable once per turn or once per round. Each geisha has stats Entertainment (Mask), Service (Flask), Intelligence (Book). These stats allow you to purchase guests, as described below. People – These people can end up being either Advertisers which boost your stats or guests which give you points and allow you to take actions. Their bonuses are on the left hand side. The top three are guests, Cost, how many points (income) you get, and effect. The bottom three are the advertising bonuses + to one of your three stats. Advertisers do not count towards your points and guests do not add to your advertising. Each person plays one action (plus any bonus actions from guests or your abilities) and that is a turn. Once all cards are out of one player’s hand or out of the deck the round ends, you total your score and move on to the next round. Turn in your advertisers and guests and keep your geisha then shuffle and deal again. Once you have played three rounds you total up your entire score and the highest is the winner. 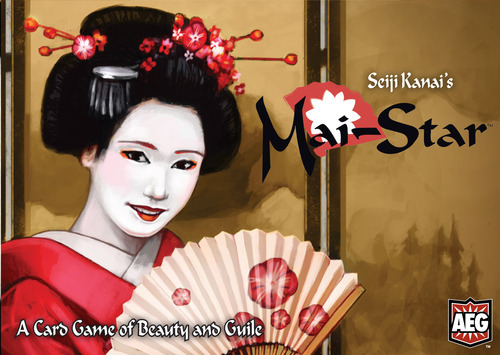 All-in-all this is a great little game that can be fast, furious and frustrating because there apparently is a lot of backstabbing in the line of a geisha’s work. One tactic I use to keep my players interested in my world is continuity. I’ve mentioned in the past that I’ve had characters meet their retired or (at times) dead characters. This is just a small bit of the gigantic pie that is my world and DMing style. Characters make real ripples in the pond of life as they adventure. I’ve taken my characters through ancient worlds and modern times, past, present, future, it all ends up the same. What they do gives purchase to what happens in the future. It’s not just the big things either. For example to teach a rather rowdy group the importance of what they called ‘starting quests’ or ‘tutorial quests’ I created an adventure for them. In this adventure the characters lived in a small town on the outskirts of a large kingdom. This town was walled in because it was on the edge of a very dangerous forest known for its excellent selection of hard wood. The first quest they got was to check on an old woman and her older son within the town walls. The two ran an alchemical business in town that had been shut down for a few days. My players scoffed and rolled their eyes at me and demanded a more important task. I complied and told them that they had heard rumors of a goblin uprising to the south and there were calls for adventurers to come and assist the king’s guard in defending the southern reaches. They left the town in search of gold and glory. Some time down the line they went back to share their glory with the townsfolk they knew so well only to find that the town was completely uninhabited. They later found out that the people they were supposed to check on had an accident in the basement that had opened up an ancient spider warren that contained a huge number of unhatched giant spider egg sacks in stasis. The adventurers all perished trying to kill the spiders. Later down the line (two sets of characters later actually) the group stumbled upon an abandoned city in the thick of an overgrown forest. This city had been overrun by giant spider creatures from a time in the past. It took them some time to recognize it but when they found the bodies of their old characters in the spider’s warrens they all found a somber lesson of humble pie served up. All of them vowed to me that they would never overlook a ‘tutorial quest’ ever again. 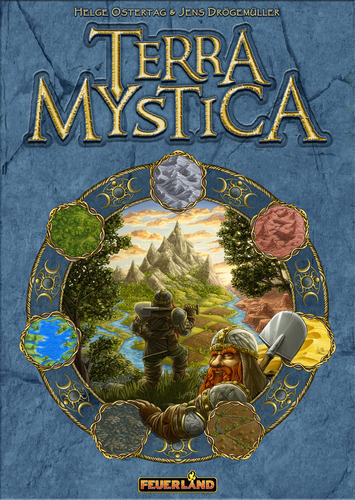 So the DM has recently purchased a copy of Terra Mystica. 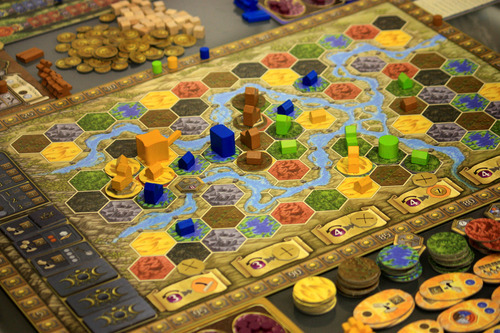 It has held the #2 slot on Board Game Geek for a while now (images borrowed from the same!) and I was curious to say the least. From what I’d seen elsewhere it looked to me like an advanced Settlers of Catan. I like Catan. 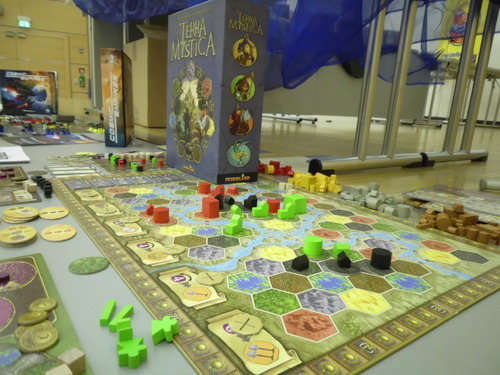 Terra Mystica did not disappoint in any way shape or form. I will say this though, the rules and initial setup look daunting but everything falls in to place as you go. Setup is the longest part. You establish what race you want and each race has its own abilities to start with and once they build certain structures. Once you establish your race you set up your board, which has a similar feel to the mechanics if Eclipse. Each building you place gives you more resources of a certain type. You then set up your starting resources and positions on the cult track. The cult track grants you power (a mana-like resource that renews slowly) and each line of the track represents a different element. Builders, Gold, Power and Priests. Building more structures takes gold and builders (Dwellings, Trade Houses, Temples, a sanctuary and a stronghold). You chose your starting locations after your factions and begin from there. The last person to garden is the first player. Upgrading your ‘infrastructure’ so-to-speak allows you to add ships to your trade lines (allowing you to build across water and count your water tiles as one long string) and reduces the amount of builders required for terraforming. Each race also has a special ability that can be triggered or used under certain conditions. This upgrade sometimes requires priests (gained from religious structures). Temples and your Sanctuary grant you favor tiles which update your position on the cult track and grant you certain abilities. The priests you get from those tiles can be spent to move your position on the cult track as well. You cycle across each player until everyone has passed (again, similar to Eclipse) and from there you move on to the next round. Simple enough. Terraforming, building, all of these things mesh well in to the game and in the end, this game is definitely worth purchasing. The first play through was a tad rocky at the start because we had to keep referring to the rules but once you establish yourself it is a very excellent game that pulls all of the good from Catan, Eclipse and Lords of Waterdeep but keeps its core effort different from all of the other machines. In the end: Buy this game, it needs to be in your library. Images borrowed from Board Game Geek. I have owned Power Grid for a little while now, I’ve only had the pleasure of playing it twice before the other night. I am a huge fan of euro games, they are elegant and usually fairly easy to grasp. 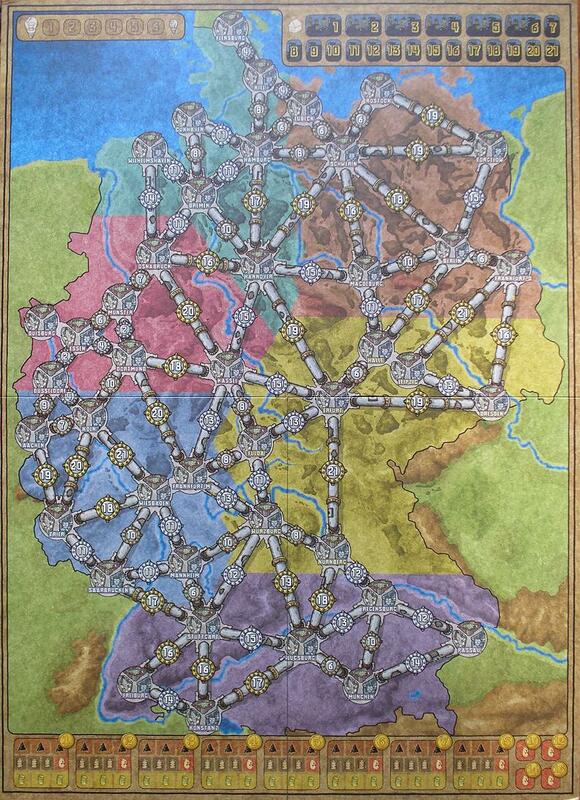 Power Grid does not disappoint in this regard. Coming from other games such as Arkham Horror and Mansions of Madness this game is a walk in the park. Set up is easy. 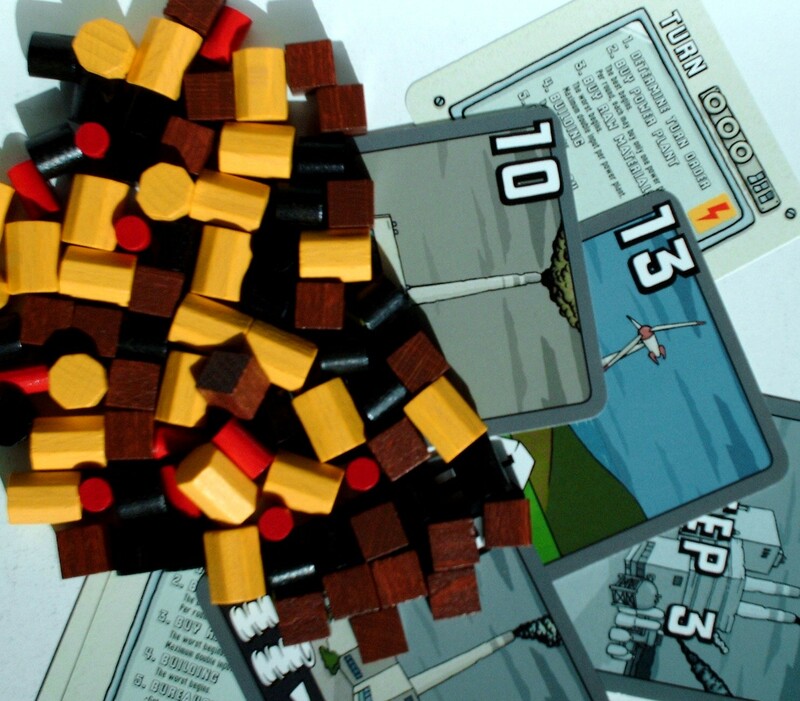 You lay out the power plants as the rule book denotes, divvy out the money and lay out the starting resources. We determine our first player by pulling a factory from the stack, whoever pulls the highest is first player. This is one of the few games I’ve played so far that starting out as the first player is actually not usually a good thing. You auction first which opens up more power plants for the rest of the players. Every person playing can only win one power plant per round and you don’t have to auction. This phase is fairly straight forward. The bits are, as expected, high quality. Everything is wooden and thick cardstock. Brown is coal, black is oil, yellow is garbage and red is uranium. Every player has their own color house that serves a representation of your factory. The player help cards are well laid out and quite useful. I found myself referencing that more than the book the few times I have played. Money is called Elektros and honestly the money is the only annoying part of the game, it tends to stick together. I would love to see a phone app for that, but that’s just me! The board has two sides, Germany and the US. Although I believe there are other boards out there, including fan-made boards. 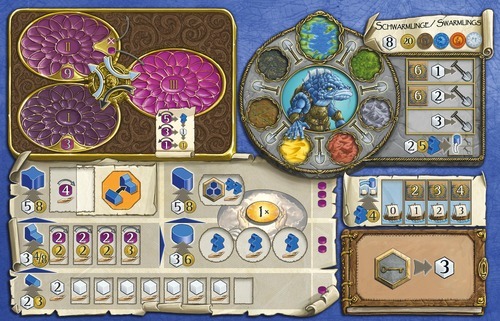 At the top of the board are the player turn order (upper left), current factory count (upper right), resources divided by cost (lower portion) and in the center are the cities and costs. Building in a city (one region per player at start) costs only 10 initially, but as you expand you pay the conduit cost listed on the pipe and the cost of the city. In phase one you can only have one player per city. Phase two opens up the 15 electro cost slot and phase 3 the 20 electro cost slot. Each phase has a defined qualifier. Phase 2 is X number of cities (depending on how many players you have), and phase 3 in the factory stack. The game ends when one player (again dependent on the number of players you have) connects X number of cities. One thing of note is the humor pasted to the outside of the box, go ahead and enjoy that little tidbit if you will. 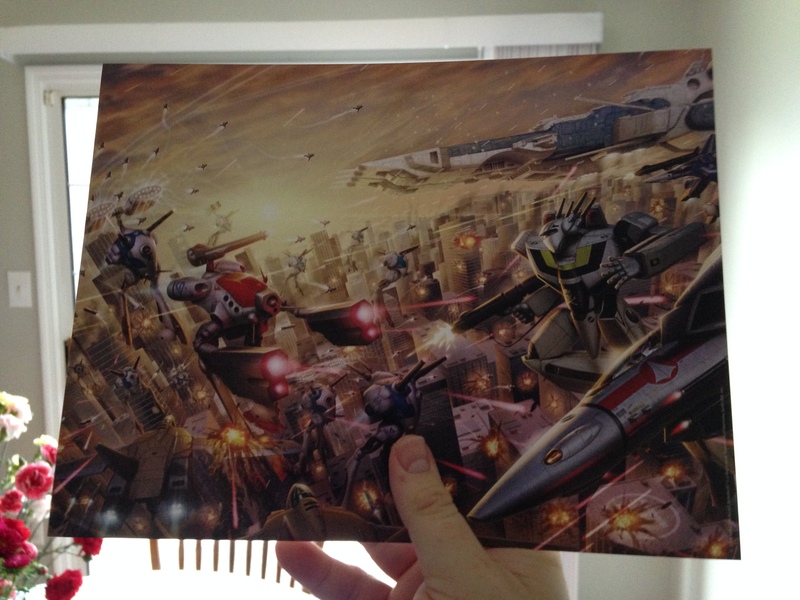 Aside from the art and color schemes, which are great, this is the best part of the box and boards. 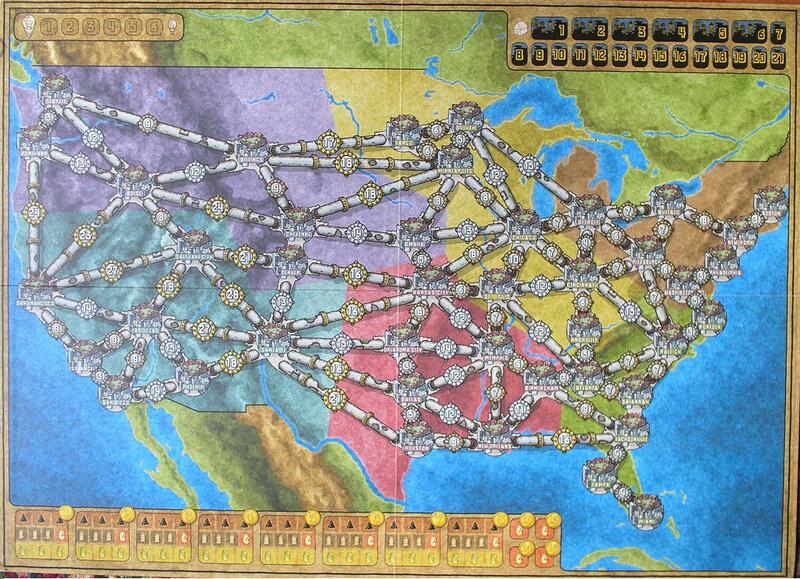 In the end you must buy and play Power Grid. It is like a fun-to-play version of Monopoly. 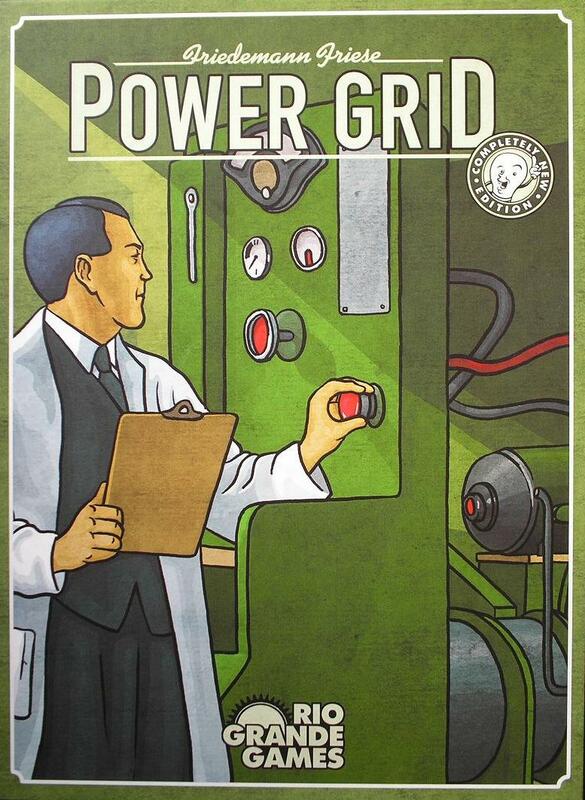 If you enjoy competition and mechanics of Monopoly you’ll never pick it up again once you try Power Grid. 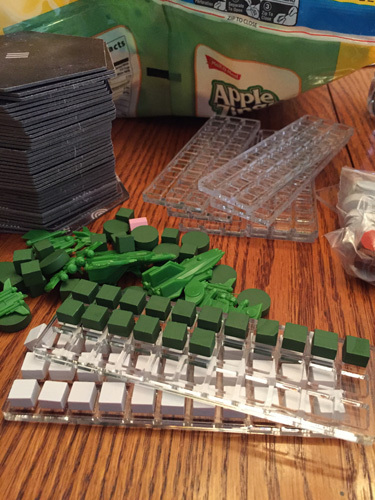 So I recently ordered a set of 9 trays made for the resource tokens that come with the board game Eclipse. The company I chose is The Broken Token (Facebook and Website). First off I had to cancel my original order for monetary issues but they were fast and friendly, a definite plus in my book! So I ended up ordering the token trays off of Amazon instead of at their site although I will most likely use their site for any and all future purchases. Their storefront is well built and has an efficient layout, another plus. 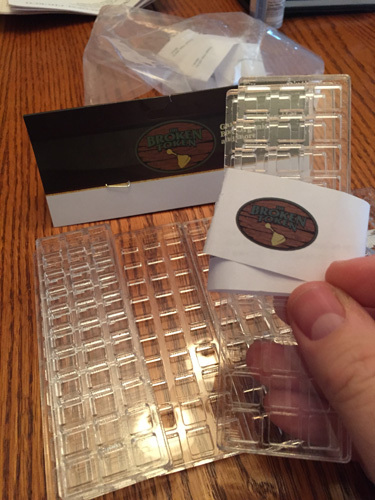 The trays were assembled in a retail-quality plastic bag and individually wrapped in threes with instructions about the possiblity of adhesive backing. There was definite care put in to the crafting and packing of these trays. I’m sold. Everything fits quite nicely and I do not regret ordering the token trays with the optional bottoms for storage. It’s much easier to get the fiddly bits that come with this game in place with the trays and the included top. You can assemble them and store them by putting a couple rubber bands on them. I may, in the future, order another 9 and use those 9 for tops. We’ll see about that though. They were definitely worth the purchase! Honestly I could not be happier with The Broken Token and they have a very wide range of products available on their website for board game organization. My next order is going to be either the Eclipse game insert or the Lords of Waterdeep organizer. Here’s hoping they come up with one for Terra Mystica! My rating? If you’re a board gamer and you want to store and organize your board games properly, look no further! The ongoing saga of Dungeons and Dragons 5th edition continues! The fat man has invested in not only the Player’s Handbook and Monster Manual but the revered Dungeon Master’s Guide as well. 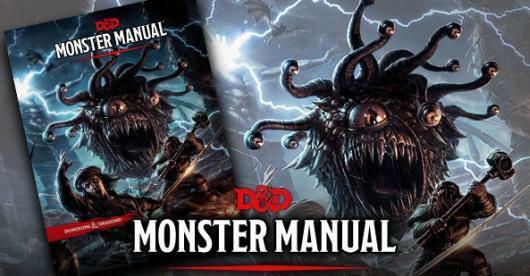 As far as the Monster Manual goes, here are my thoughts. 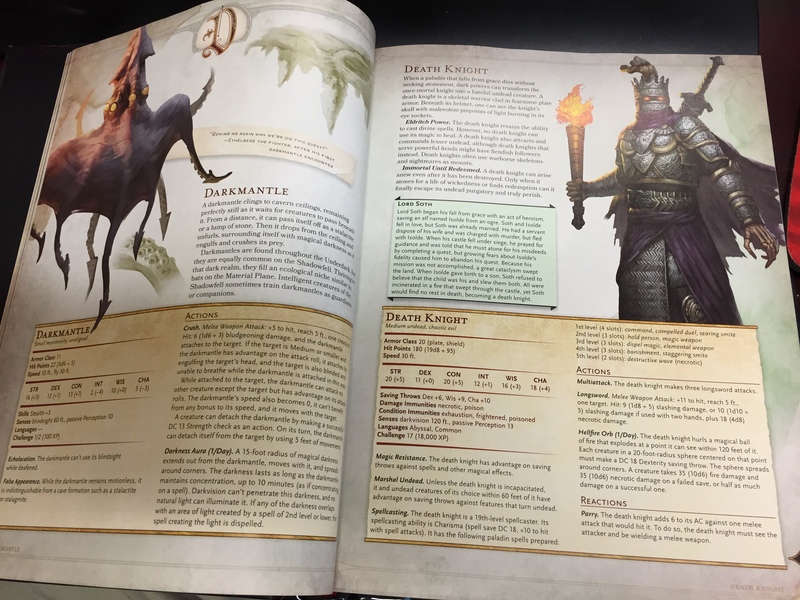 The Monster Manual is packed with deliciously gorgeous artwork and horribly vile creatures of all types. Every page has something to say and most of it says “Look at me, I look like the 2nd edition Monster Manual!” That’s the feeling I got from reading this book. It feels like a trip down nostalgia road on the RPG fairy’s personal jet. The introduction and basics set a framework down for Dungeon Masters. The little bits of information it gives are worded well and not long-winded. It provides just the amount of information you need to get your monster on. Gone are the strangely structured stat blocks with tons of confusing information crammed in to a small space. Everything is framed and organized in a very friendly-to-combat manner. Referencing a given monster’s statistics and abilities is a lot easier in this format (of course that could be my opinion!). The pertinent information even has its own section from names to types to base stats. Honestly the only thing I miss from these entries is the history and detail that went in to the origins and life of the creatures. The 2nd edition MM had so much detail that you could spend hours just pouring over each entry crafting elaborate scenarios based on behaviors, histories and habits. While I do miss that, I am very pleased with the MM’s organization and details otherwise. Pertinent information such as the green text box under the ‘Death Knight’ entry adds a splash of those formerly glorious bits of lost information. The artwork, as I said before, is fantastic much like the artwork from the PHB (Player’s Handbook). The new direction of the art makes the creatures seem more real and believable. For those of you who don’t enjoy describing the monsters to let your players figure out what the hell they’re beating up, this book has you covered. Every entry evokes a sense of wonder or horror depending on the monster you pick and it never feels cartoony or contrived, every piece flows with the information given. All-in-all I have no complaints about the artwork, only praise. I can’t say enough about 5th edition! It continues to impress. 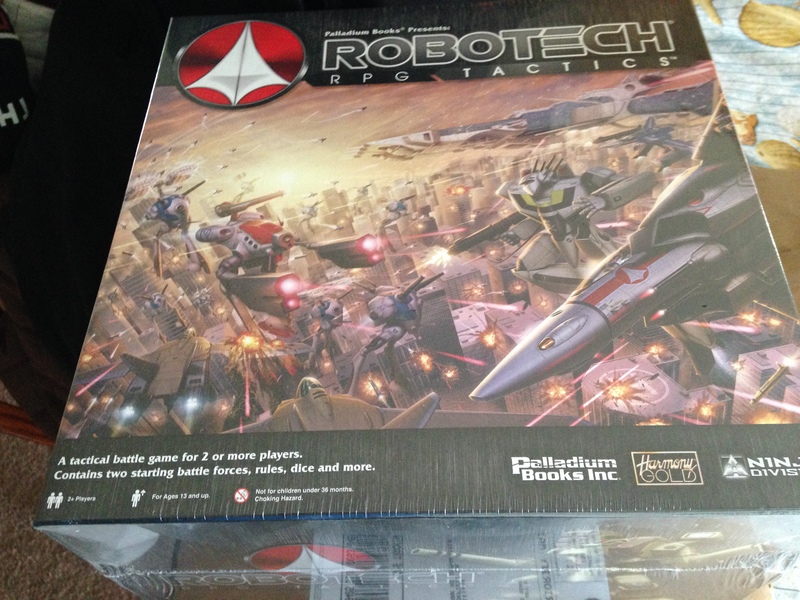 So I received my copy of Robotech RPG Tactics the other day. The unboxing in all of it’s glory will follow but for now just a short view of what came with my Wave 1 pledge. First off I must say that the box art is spectacular! The box itself is solid and feels as if it will withstand shelf wear well. Points for Palladium on that, I hate flimsy boxes (I’m looking at you Fantasy Flight!). The second item I pulled from le box was my bonus Wave 1 miniatures. This bag is still unopened, we’ll get to why later. Next we have the Battlefoam bag. This is one of the best parts of this Kickstarter. 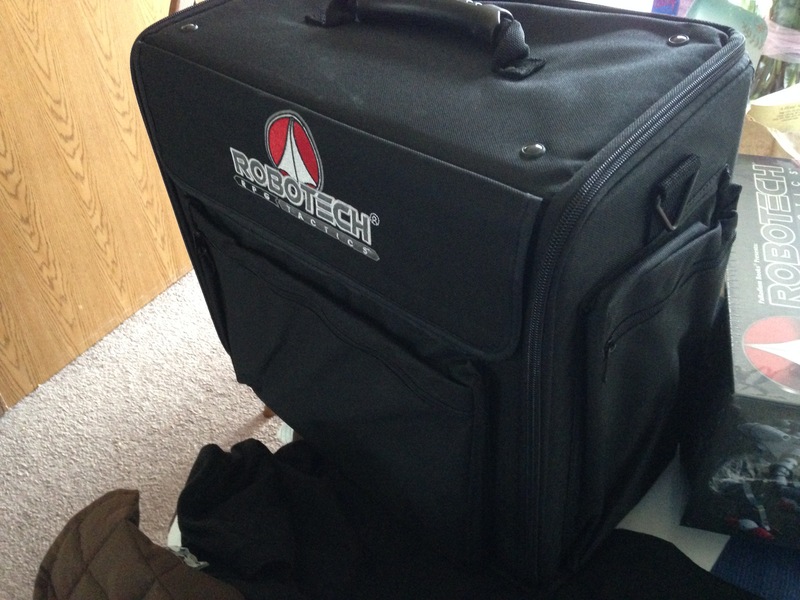 The Battlefoam bag is sturdy with tons of pockets and compartments and there is enough space inside to carry my entire fleet of ships it seems! The material is thick and strong and the foam inserts feel solid as opposed to some inserts I have dealt with. And bonus! Look what I found inside the bag. A print of the front cover of the box. I’m quite happy with the quality of this print, it feels solid. I’ll definitely be framing and mounting this guy like a redneck mounts a deer head (creepy). Hey not judging, I have rednecks in the family. The first look inside the box has gotten me a little jittery. The old hands don’t work so well so assembly is daunting for us precious, yes it is. 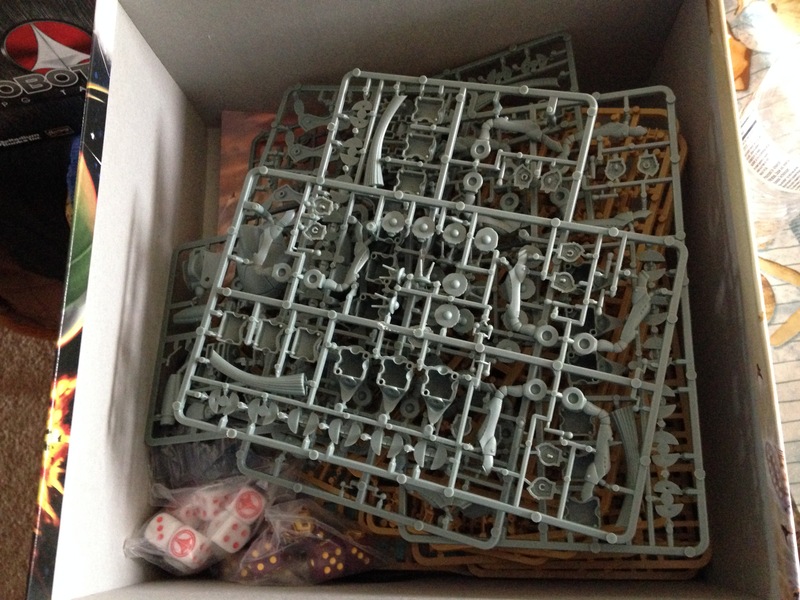 Harg, SPRUES! Harg, Lots of them! Oh well, we’ll get to that down the line. 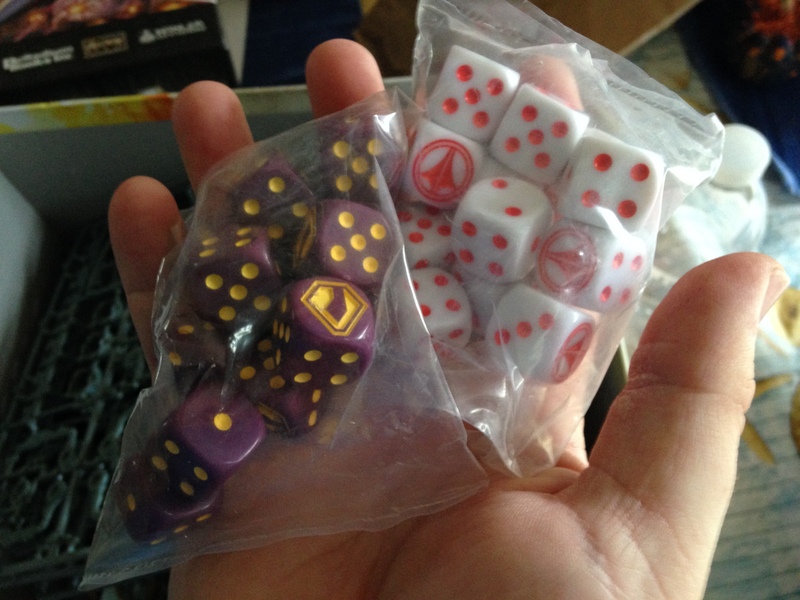 Anyone who knows me knows I am a sucker for dice, hands down. I have tons of them and you can never have enough dice. Weird dice to useful dice. Doesn’t matter, have dice. These guys are good quality. Solid plastic with colored pips and a special ‘6’ side. But what’s to review beyond that? Dice. Now onto assembly. Oh the humanity. The instructions, for me anyway, were woefully devoid of true explanation so some figuring out was required. No matter, I’m a reasonably intelligent mammal so here we go! 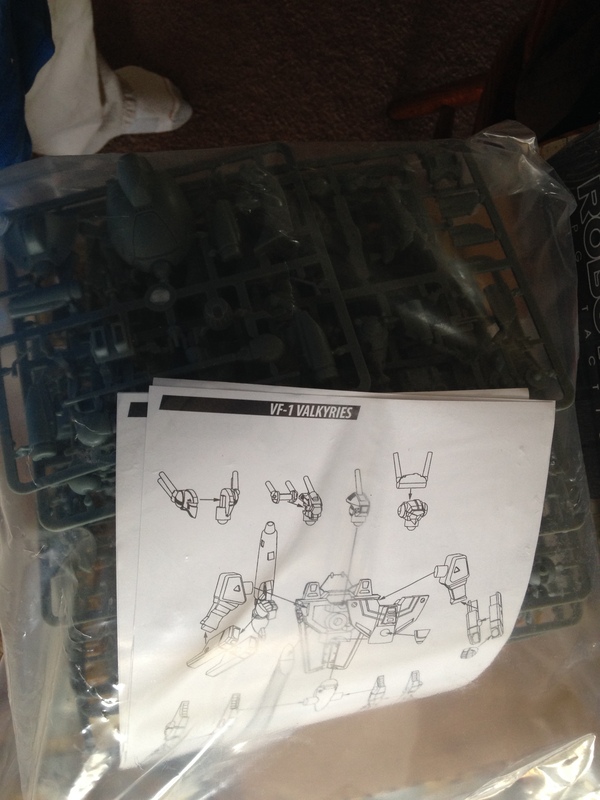 The first part I assembled was the main body of a guardian-mode Valkyrie. 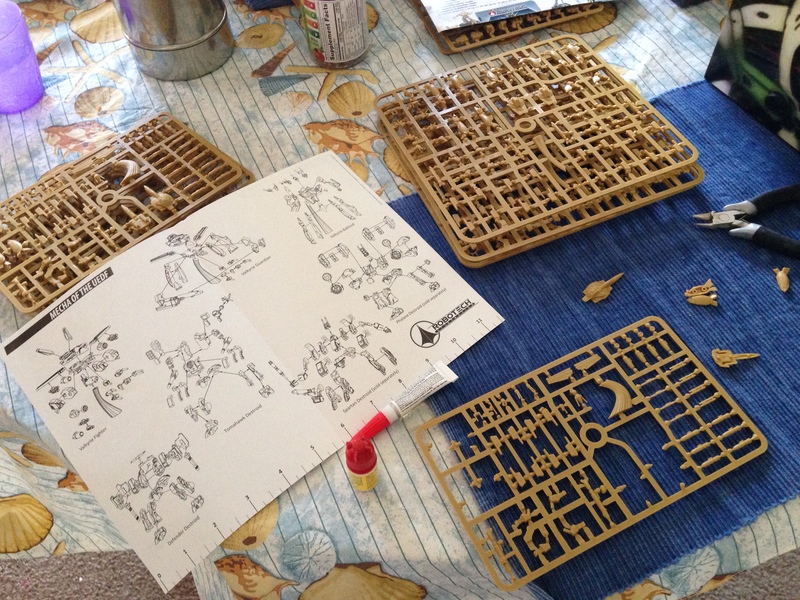 I chose this because it was the first sprue I put my hands on. Putting everything together (once you guess where it actually fits) is the easy part. You put a dab of glue in the hole and put the piece together, easy enough to prevent too big of a mess. 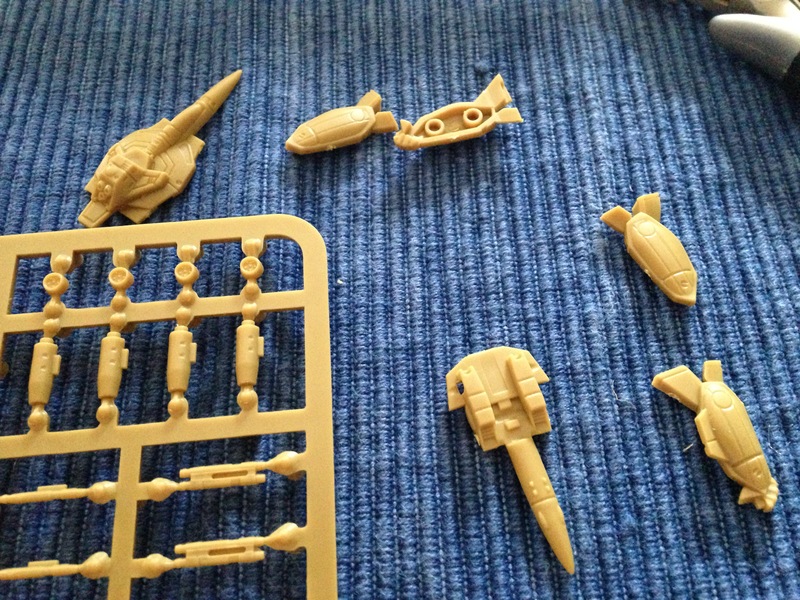 The only parts so far that I have had a problem with are the nose-cone and the leg-to-torso joints. For the case of the nose cone I recommend a dab (oh so small) of glue at or around the tip to keep it flush. Mine kept coming apart just a hair. The leg joints fit in a small grove at the rear of the bottom half of the jet body. This tiny little hole-and-peg configuration was difficult for Mr. Monkey hands to hold together without getting glue all over himself. 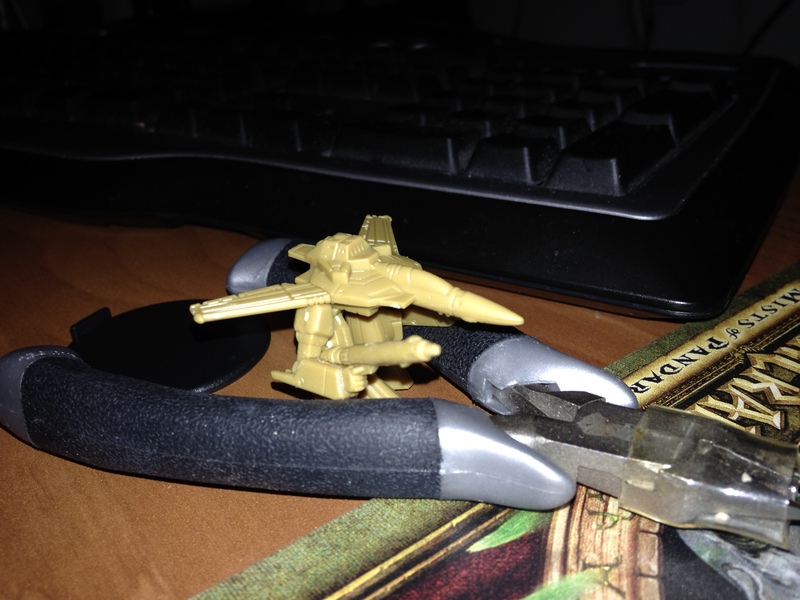 I had a similar problem assembling the arms, they are relatively small so putting a dab of glue in a single peg hole isn’t enough. You have to line it up well so I suggest putting it down on a flat surface after applying the glue (and wiping the excess off of the part going on the flat surface!). Once you assemble the lower arm you have to attach that to the upper part of the arm. Now the arms, as I’ve found are interchangeable. You can either have the arms holding the gun or (as I have below) have a one-handed gun configuration. Both look pretty neat. The wings were easy to glue. There is a tab and slot that holds them in place for you pretty much. The model below is almost complete. 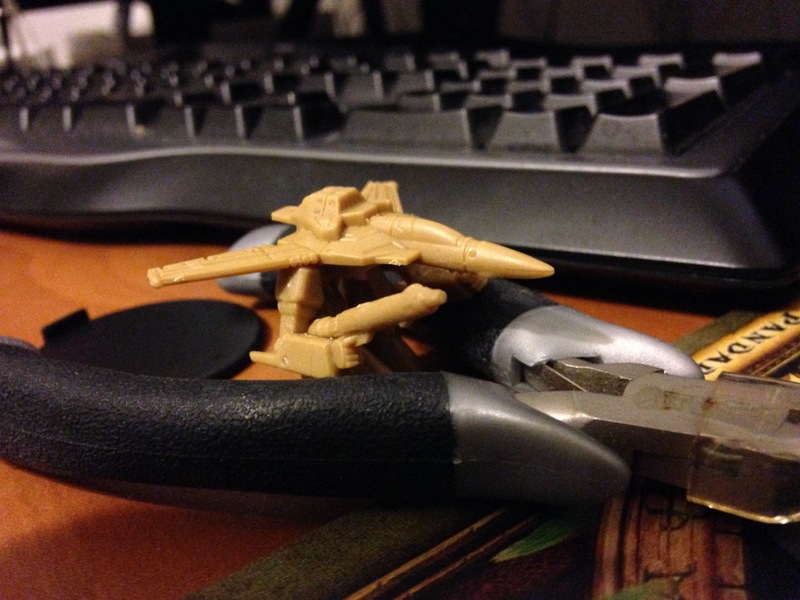 I have to put the gun turrets on the bottom of it and they are teeny tiny! I mean crazy small! So we’ll see how that goes. All-in-all except for rather vague assembly instructions this is a solid product for those Robotech, RPG, and tactical combat monkeys out there. Definitely worth the buy.